Unfortunately for Anthony, he didn't change enough of his text. The scientists were investigating the impact of ocean acidification on the behaviour of fish. This time they compared behaviour of juveniles at different sites (one control site and one CO2-seep site), observing the species: Dascyllus aruanus (average total length: 17.0 mm), Pomacentrus moluccensis (19.8 mm), Apogon cyanosoma (22.9 mm) and Cheilodipterus quinquelineatus (22.3 mm). These are small fish, the largest being less than an inch long. The scientists selected three reef sites where ocean water is naturally more acidic from CO2 seeps (that is, more acidic or less alkaline than the ocean as a whole) and three control sites close by, where the ocean is less acidic. (See note below.) They found that that "juvenile reef fishes at CO2 seeps exhibit behavioural abnormalities similar to those seen in laboratory experiments". What the scientists found was that high CO2 didn't make any difference to metabolic rate or aerobic performance, which is a bit of a surprise to me. 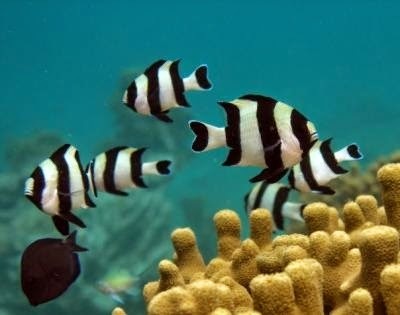 In regard to behaviour, the fish on the high CO2 reefs "were attracted to predator odour, did not distinguish between odours of different habitats, and exhibited bolder behaviour than fish from control reefs". The lead author, Professor Philip Munday, kindly sent me more information and suggested I clarify this article, writing - my bold italics: "while we examined the community structure of fishes at three CO2 seep sites, and paired controls (as you carefully point out), we only studied the behaviour of the fish from one of the CO2 seeps and a nearby control reef." You can read the paper (or abstract) at Nature Climate Change. There's a press release at ScienceDaily.com and a short interview by Felicity Ogilvie with Philip Munday and Jodie Rummer on PM at ABC Australia. Fish from acidic ocean waters less able to smell predators smells fishy to me. Just ask any salt-water aquariaist how hard it is to simulate the ocean in a fish tank and keep the fish from being stressed. Yes, it can be hard to keep fish from being stressed if you don't take care of your tank. However stress would normally affect the metabolism of fish. If the fish being observed at high CO2 sites were stressed from being observed, it was no different to the stress response of fish at the normal CO2 sites, going by the fact that there was no difference in metabolic rate or aerobic performance between populations at the control site and at the high CO2 site. The failure of this claim is clear when you watch the video below, showing natural CO2 bubbles coming off the sea floor in Milne Bay, in Papua New Guinea. They use this as the “control” for the experiment, according to the caption, when they should be using a normal reef and doing the experiments in situ. That sentence doesn't make any sense. Anthony didn't write the full caption to his "video below", but he did provide a link to the video. The caption read "Scientists collected fish from the coral reefs shown here and found that fish from the more acidic waters of the bubble reefs were less likely to detect the odor of predators." Anthony said that the high CO2 reefs were the controls. They weren't. They were the experiment. The controls were nearby reefs with no CO2 seeps and higher pH. It's all described in a table in the supplementary information. ...they transport these fish back to the the mobile lab (on a boat), perform experiments, and assume there is no difference in the environment that may contribute to behavioral differences. They apparently don’t stop to consider that BOTH groups of fish in the mobile lab might be stressed the same way. five times in the press release Anthony copied and pasted here and here and here and here and here. with details in the supplementary information. And if he'd known more about the research, like maybe reading the list of references, then he should have cottoned onto the fact that maybe, just maybe, the authors were referring to an earlier study when they say "in the lab". A study like the one described in this 2010 paper in Ecology Letters, which is listed as a reference and was written by some of the same authors. In that study the fish were reared in a tank in the lab, not the ocean. They simply ignored the most obvious control group test and did no actual in situ experiment. But the press release and abstract Anthony copied and pasted in his own article stated there were control groups (at three control sites as it turns out - but see my update above) and while measurements were taken on the boat, the fish came from the ocean itself, not a lab. Then there’s the most obvious question they didn’t ask: if CO2 affects the fish behavior so poorly, making them more susceptible to predators how is it that they observe “Contrary to expectations, fish diversity and community structure differed little between CO2 seeps and nearby control reefs.”. How would the fishes near CO2 bubbling reefs survive if their predator response was adversely affected. They claim there’s less predators near the CO2 bubbling reefs. Well hello! Wouldn’t that mean the fish were conditioned by their lower predator environment to be less afraid of predators to start with and CO2 may not play a role at all? Our results suggest that recruitment of juvenile fish from outside the seeps, along with fewer predators within the seeps, is currently sufficient to offset any negative effects of high CO2 within the seeps. It's suggested that, despite the fact the fish weren't able to detect predators, the population may be maintained by recruitment from outside the high CO2 area plus a paucity of predators within the high CO2 area. Anthony decides that "It is such a spectacular failure of the scientific method I don’t know how this got past peer review." When in fact it's Anthony who fails - not so spectacularly for him. He's failed more spectacularly on other occasions. His article reads as if he wrote a previous wrong version (going by his changed headline) and then, instead of admitting his error he tried to cover himself, but not well enough. His complaints don't make sense. Anthony seems to want the researchers to make refined observations of behaviour while leaving the fish in the reef. Is he suggesting they strap microchips onto the tiny fish (the largest being 22 mm or 0.9 inches) and all their predators and track their movements for days on end? And how does Anthony suggest the researchers measure the metabolism of the fish while the fish are still in the ocean. How about their respiration? Does he expect the researchers to put a teeny tiny gillmask onto the teeny tiny fish while they swim about the reef? And how does Anthony suggest they limit other differences between the control environment and the high CO2 environment so they can properly compare behaviour? You can read how the measurements were taken in the supplementary information here if like me you don't have access to the paper itself. Anthony Watts doesn't just have a "thing" about fish, he has it in for these particular researchers. 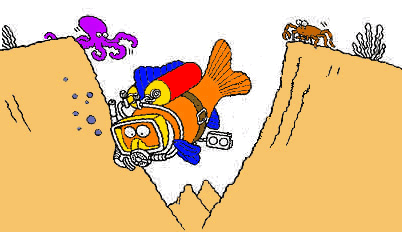 He wrote about a previous study they did on clown fish a couple of years ago, thinking it was funny that clown fish behaviour was impaired in high CO2 waters (archived here). Maybe we could do a research study about what causes Anthony Watts faculties to be impaired when he sees scientific articles about fish. Here's a hypothesis. He once tried to set up a marine aquarium but messed it up and killed all his fish. I suppose if those fish were thirsty, they would prefer to drink Perrier. April Fool’s day is long past, so this means I must have mistakenly side-stepped to The Onion instead of WUWT. Seriously though, if research like this was done on their own dime, it would not matter too much and it would be just good for a laugh; but it looks like this was a formal scientific study paid for by taxpayers. Bubbling reefs would be similar to predators that use air bubbles to drive fish in circles to eat them Fish are not dumb and reef fish would get use to bubbles and lack of preditors Bubbles would make it harded for them to see predators when they do come into the area. Their control should of included the first week of placing bubblers around the reefs, I bet the fish were scared until they got use to them. Of course it cannot be due to the fact that they were raised without the usual predators. Nah! Every one is scared of a saber tooth tiger and area always sniffing the air for them. they (georgia) keep producing this crap just to embarrass the hell out of the rest of us……..
More faux science, like that from the lobster kid, designed to basically see if angels, dancing on the head of a pin in a high CO2 bell jar, prefer the can-can or the limbo. So, fresh water fish must be at a terrible disadvantage…we obviously need to salt the lakes and rivers to help them smell better! Q. How do you keep fish from smelling? A. Cut off their noses? Ok, you guys have had enough time already….and not one word about the corals….in the acidic ocean water with CO2 bubbling up through them. You can’t lower the pH until you use up all of the buffer! If you are going to debunk this study, try to write credibly. It’s hard for me to agree that this study is sloppy when you, the source, are writing like mud. You are also spelling names wrong making you even less legit. F+ for wasted time. I thought ocean CO2 “acidification” was going to exterminate the calcifiers. So how is it that there’s a reef at all around a pH 7.8 CO2 seep, much less a thriving reef with all sorts of species diversity? By the way, Rud, H2S is even more toxic to we mammals than is cyanide. It’s just we can smell the stuff at 1 ppb in air and get away. Nearly pure CO2 bubbles have been gassing through the seafloor for an unknown period (confirmed for approximately 70 years, but possibly much longer), locally reducing the seawater pH. No reef development is found at pH <7.7, so areas of intense seeping were not included in the surveys. It becomes increasingly clear that Watts has had no scientific training and doesn't think like a scientist. The experiment sounds like a classic little experiment with a not wholly expected result that gives us something interesting. If Watts had been a bit more alert, he might have pointed out the fact that the fish seemed able to adapt to higher CO2 levels but because his default setting is to deride scientists in general, his blinkers ensure he failed. Has anybody ever added up the number of scientific disciplines where Anthony thinks he knows better than the people who actually have a clue? "These are small fish, the largest being less than an inch long. The scientists selected three reef sites where ocean water is naturally acidic from CO2 seeps and three control sites close by, where the ocean is less acidic." None of the sites in the paper included ocean water that was "acidic." I think you mean "less alkaline." Silly anonymous. Chemists use less or more acidic as a comparative term. Just like if today is -20F and tomorrow is -10F, we'll say "tomorrow will be warmer than today". Of all the stupid trolling anti-science comments common in the denialsphere, this is one of the most common, and demonstrates deep ignorance of both science and the english language. Nonsense. There is nothing wrong with being accurate. Ocean acidification is an accurate term because the phenomenon described is an ocean becoming more acidic even if it was alkaline to begin and end with. But saying they conducted research where the ocean was "naturally acidic" is just an error. I agree with anonymous. "naturally more acidic" would have been correct. Actually, experts are not bound by the ignorance of non experts. If there is a substance with a higher activity of H+ than a reference has, and it has historically been called acidic, then calling acidic is not an error. As in: acidosis in blood has a pH above 7. I too concur with Anonymous, and Marco preempted my own addition to the conversation. haha did he really write "How would the fishes ..."? The obvious next question, which clearly neither Anthony nor anyone at WUWT thought to ask, is, "if the behaviour of the fish changes towards their predators, does the behaviour of the predators also change in more acidic seawater?" The paper is about "behavioural impairment", after all. As I understand it, most of the fish humans eat are from predator species so impairment of predators is potentially significant.